People that are involved with the healthcare field may often feel overwhelmed by the medical language and processes that are present on a day-to-day basis. Some patients with serious illness or disease may be forced to accept patient recommendations simply because they are not aware of different options or they do not completely understand their treatment options. A whole new class of professionals called patient advocates can assist patients with better comprehension of medical practices, as well as their rights and options while in medical facilities. Patient advocacy may have began in earlier days, with families and friends standing alongside patients in a hospital setting. Those that were more knowledgeable about medical practices and procedures could help those that they loved better understand the treatment process and everything that was involved. This practice may have evolved into a whole new realm of professionalism in which central advocates could help people from all walks of life. If you are interested in learning everything there is to know about the healthcare field, MHA degree programs are an excellent option for you. These programs can help you train to become a helpful patient advocate that truly knows the ins and outs of the medical process. Your knowledge can include financial understanding in healthcare, policies and rights of patients, and a better understanding of healthcare language. This helpful guide can help you to gain more information about the field of patient advocacy and the degree program that can lead you there. Our team of educational experts has decades of experience in researching educational programs, and can help you to learn more about the costs, length of time, and consistency of these programs. Read more in the guide below to familiarize yourself with the field of patient advocacy. As a primary component of patient advocacy, customer service is a basic – but important – part of this professional role. Advocates that work in busy hospitals or medical centers often provide front line support to patients and their families that may be unfamiliar with the medical environment, or those that may just be uncomfortable or overwhelmed in this situation. Providing basic support services, navigating families around a crowded hospital, and helping during the communication process with medical professionals may be a primary task within this role area. Understanding treatment options and costs can be difficult for patients that are already dealing with the symptoms of their ailment. Patient advocates can use their knowledge to help patients and their families better understand their options and the costs that may be associated with them. Advocates can work with financial departments of hospitals to determine what the costs of procedures or hospital stays may be, analyze these costs according to patient insurance, and provide their clients with a more accurate idea of what costs they may be facing during the process. Medical terms and lingo are often overlooked by patients that do not have an extensive knowledge of the healthcare field. Those that are receiving treatment for painful or debilitating illnesses may be quick to accept treatment plans from doctors without analyzing the costs of their decisions. Patient advocates can work with patients and their families to better understand what types of treatment options are available, the side effects of such treatment, and the benefits of choosing other options. Using all of the information from the previous role assignments, patient advocates can help patients make decisions that are within their best interests. This can include a thorough discussion with their patients and families to pick through the benefits and risks of each potential choice. Advocates may be able to ask constructive questions to medical providers in order to get information that may have not been disclosed originally. At this point, advocates can really help to set patients’ minds at ease prior to receiving different types of medical treatments. The patient advocate should be knowledgeable about the different health-related policies and procedures available within the healthcare field. Assisting patients with becoming aware of their rights and demanding fair and ethical treatment is a large majority of what this career field is all about. Professionals that choose to work within this area may have the ability to notice situations in which patient rights are being compromised and advocate for change. If you choose to pursue a MHA that can lead to patient advocacy, you should prepare yourself for a journey of thorough learning in areas that include patient care, medical policy, and ethical treatment. At the masters level, students may take a deeper dive into a curriculum that is focused on creating more effective healthcare professionals that have further knowledge in the daily operations of healthcare facilities and the maintenance of large numbers of patients each day. The list below is a helpful resource for upcoming patient advocacy professionals. Our team of educational experts has picked through MHA programs across the country to better define this degree program starting with its curriculum. Depending on the university you attend and types of specializations you choose, the courses you take could vary. Read more about the topics of this program in the list below. Healthcare Policy: This course can help students familiarize themselves with the policies and guidelines present within the healthcare field. The role of the healthcare systems, rules for operation, and fair treatment may be some topics that students can learn about through taking this course. Students can gain a better understanding of policies that relate to patient care and services, so that they can become more knowledgeable advocates for the clients that employ them. Interpretation of Healthcare Data: Students enrolled in this course can learn more about the common data sources in the healthcare environment. Epidemiology, biostatistics, and data interpretation may be some of the main components for success in this course. Those that complete this course should have a better understanding of the data collection methods and translation methods available to patients and healthcare professionals in the U.S. Patient Rights and Privacy: The main purpose of this course is to outline the rights of patients that are treated by healthcare professionals throughout the country. Students can learn about the methods for fair treatment in hospitals and healthcare facilities, eligibility standards for services, and patients’ rights to privacy. This knowledge can help advocates provide better services and better protect the rights of their clients while working in the field. Busy and working adults may not want to commit to degree programs that are drawn out and beyond their expectations in terms of costs. One of the most important steps in choosing a degree program is to analyze the costs of programs in comparison with each other. Students that take the time to research programs for the best deal could end up saving a lot more money and time in the long run. Our team of experts has determined that there is a large variation of costs between universities that offer the MHA degree to interested learners. The list below shows the tuition rates for a few popular schools that offer this program, in hopes to help you make better informed decisions about your future degree program. Read through the list below to see the tuition differences between these popular universities. It should be noted that we pulled this data from their website in 2018 but these numbers and length of programs can change quickly. Students that are considering this degree/career field may be interested in their ability to earn at this professional stage. Like most career options, students may be surprised to learn that there are several different factors that can influence their earning capabilities in patient advocacy. Since some professionals in this field may work for hospitals or healthcare organizations, their earnings can depend on the amount of professional work experience they have partnered with their degree level. Professionals that choose to work in private practice may have more power to extend their earnings based on their reputation in patient advocacy and the extent of services that they offer to their clients. You may have the freedom to explore thorough options for patient assistance in this field, making it an excellent and versatile option for a future career. Some average salary data is listed below to help you see a clearer picture of the average earnings for professionals in this area. Healthcare Social Workers: $56,810 on average per year (BLS). What type of work experience should I have to become a patient advocate? : Patient advocates can often provide a much needed service to patients in the healthcare setting. Degree programs can teach you a lot about the different services, laws, and regulations that are present within the healthcare field, but work experience can often realistically portray what is required in this career. Having some experience working in the healthcare field at any level can help bring what you have learned to life. 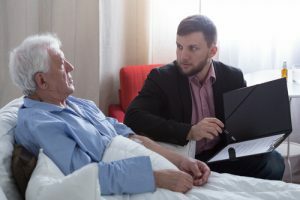 If you want to provide a knowledgeable and meaningful service to clients, you should consider gaining some experience in the healthcare field prior to advocating for clients one-on-one. Can I work in various fields within healthcare? : A positive aspect of working in patient advocacy is the widespread application of this field. There are many different healthcare organizations, specialty clinics, and rehabilitation centers that house millions of patients each year. Patient advocates can help to provide assistance to these patients, making their journey to good health much easier. Your services could be called upon in many different areas of healthcare, making this a great choice for professionals that like some diversity within their career. What type of clients can I work with? : While most people may believe that patient advocacy is for people that cannot make their own healthcare decisions, are not able to comprehend the guidelines of the hospital environment, or do not have family to help during the decision process, there is actually no limit to the type of client you can have in this career field. The healthcare field is full of unfamiliar terms and guidelines that can affect the lives of individuals that are involved with them. Your services could be beneficial to people from all walks of life.